If you are in need of a space saving hammock stand to use with you hammock chair then there are a range of hammock c-stand and hammock chair swing stands to choose from some some high quality manufacturers. Below you will find vertical hammock chair stands from top hammock brands such as Hammaka and Hatteras as well as hammock C-stands from Best Choice Products, Sunnydaze Decor and Bellezza. The majority of the upright hammock stands below feature space saving designs making them a great choice to use indoor and outside should a horizontal hammock stand be too long for the rooms in your home. All of the hammock chair stands below are easy to assemble and able to accomadate the majority of hammock chairs and air chairs comfortably. With a range of hammock stands available with weight capacities ranging from 255 – 350 lbs and the stands heights ranging between 79″ to 93″ below you will be able to find a well suited chair hammock stand to fit whatever hammock chair or swing seat you own. Many of the chair stands listed below are available to buy with a hammock chair included from the same manufacturer, if you are looking for an easy to use all in one solution take a look at the hammock chair stand combo sets or if you are wanting to mix and match a hammock chair with one of the upright hammock chair stands why not take a look at some of the great hanging hammock chairs and air chairs that we have listed on My Hammock Stand. After reading the product descriptions on each individual page you can also have a look at what other buyers have said in their hammock chair stand reviews to get a good summary of what is good or bad about each particular hanging chair stand. If you are still in doubt if the hammock c-stand is right for you, on visiting the retailer you can read further FAQ’s asked by other potential buyers which will provide excellent insight into further product specifications that the manufacturer may not have included. Take a look in the tab below to find out what we consider to be the best hammock chair C-stands and hanging chair stands available to buy in the US. If you are looking for the best vertical hammock chair stand or hammock c-stand but do not have the time to shop around one of our recommendations below should suit you perfectly. The selection of hammock chairs stands below are in our opinion among the best rated available and also include some of the most popular. The varied selection of hammock chair stands below are often available in a combo set with a hammock chair included, you can view the best hammock chair and stand combo sets here. Although this is not the most highly rated hammock chair C stand it is very popular. 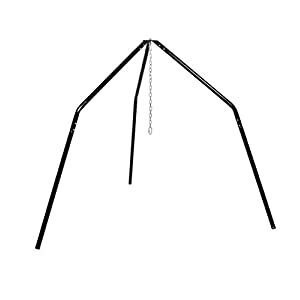 The main problem many find with this C stand for hammock chairs is that it is not as sturdy and durable as other hammock stands and the 300 lb weight capacity stated by the manufacturer may not be accurate. While most feel this is an excellent hammock and air chair stand you may wish to look at the reviews on visiting the retailer or on the product description page before deciding on a purchase. The only slight complaint from some with this Bellezza hammock chair stand is that the hammock c stand could be a little taller, to ensure a good fit if you do not already own a hammock chair, you may wish to purchase the stand in a combo set from Bellezza (Pictured) . With most finding this an exceptional hammock chair stand this is a good choice for anyone looking for a space saving hanging hammock chair stand that is durable and well made. A highly recommended hammock chair stand and one of the best if you need a little extra height thanks to the 10″ extension that allows for a height setting of either 85″ or 95″ in height. Many state how solid and durable this unique and good looking stand is. 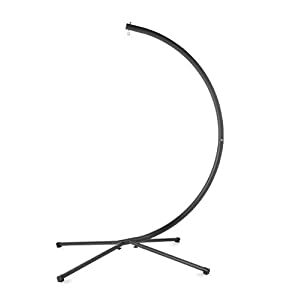 If you are looking for stability and the option of a little extra height then you certainly get what you pay for with this hammock arc stand, ideal for the majority of hammock chairs. One of the most sturdy stands around that is capable of holding a swing chair or hammock chair with ease, this taupe colored stand is very strong with a 350 lb weight capacity and large 8 ft height. If you are looking for a large hammock chair stand then this is a great choice, the only question to ask is if you have enough room if you are using the stand indoors or in a small space since the base of this hammock stand has a 60.5″ diameter. Overall this is a very good vertical chair stand to consider that has a lot of style, the only downside is that this good looking hammock chair stand is that it’s slightly less portable and heavier than many of the other hammock chairs stands around. Ideal for anyone wishing to adjust the height of their hanging hammock chair. Able to be adjusted through 5 height settings through a range of 79 to 93″ in height this hammock strand is a good choice for anyone who is worried their hammock chair may not fit some of the shorter hammock c-stands. With an above average weight capacity of 330 lbs and coming complete with a 1 year warranty from Sunnydaze Decor this vertical hammock stand is a good choice and can also be bought with a hammock chair included (Pictured) with a range of color options available.